Any story telling session among sailors out here on the West Coast will not go long before someone mentions Sterling Hayden. Writer, Actor, Father, and mostly Sailor, he was a larger than life character who touched the lives of many, but perhaps especially those concerned with boats and sailing. It seems that many true sailor’s character is firmly attached to their ship, they are inseparable and one is handicapped without the other. So it was with Sterling and Wanderer. 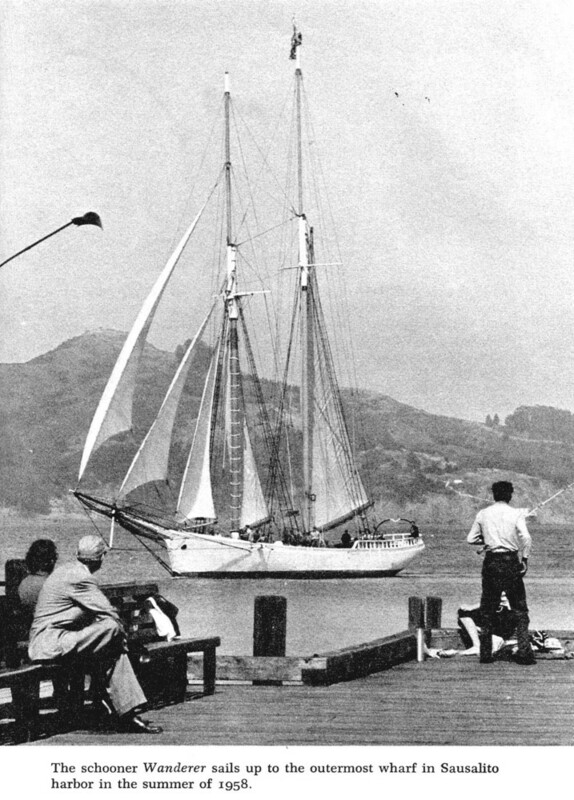 She was launched as the Gracie S. in 1893, built at Union Iron Works in San Francisco Bay as a South Pacific trading schooner. She was named for a niece of her first owner, sugar baron Claus Spreckels. 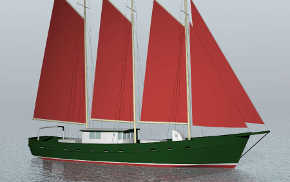 But that time was drawing to a close and the steam schooners were fast replacing sail. So she was relegated to the life of a pilot boat in San Francisco, were she worked the harbour entrance under cut down rig for 52 years. Sterling bought her in 1946 for $7000 when he was 30 years old, he sold her once and bought her back when fortunes turned. She was 95’ 6″ on deck, 81′ on the waterline, beam 24′6″, and draft 11′0″, 100 gross tons. 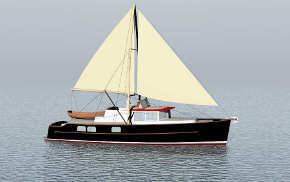 Garden outlined her general arrangement….The after 12 feet is Lazaret with access through a door under the main companionway. Then there’s a fine after cabin 18 by 20 feet with 6 berths along the sides and benches in front, the table is centered under the skylight. Next forward is the engineroom to port of the mainmast and a messroom to starboard. Then the galley and an 8 man foc’sl around the foremast, then a crews head and forepeak. 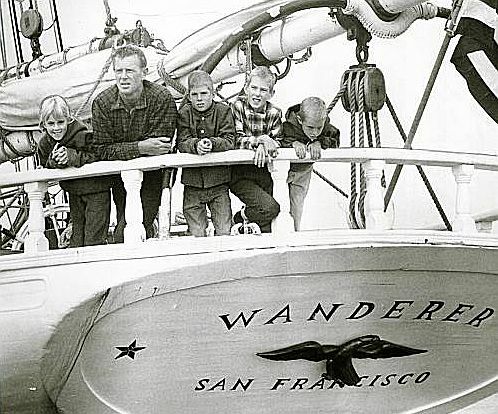 Eventually Sterling sailed Wanderer back to Sausalito, and he moved ashore to write a book called Wanderer; an autobiography named after after his ship or his life. 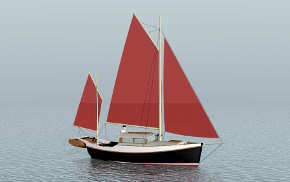 Wanderer was chartered and sailed twice more to the South Seas with young crews of escapists. Then in the dark on November 1st of 1965, rounding the southern tip of Rangiroa Island in the Tuamotus, she went hard aground. In 20 minutes the 11 crew-members abandoned ship in a rubber boat. She was a total loss almost instantly in the high surf on a coral reef. 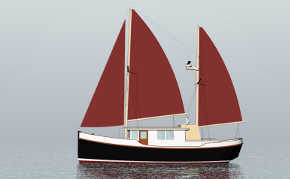 Her skipper, William King, stated afterwards that he should not have been there. But Wanderer was were she belonged, sailing the South Pacific. Thank you for this write-up. I am reading Wanderer right now, and finding it wonderful grist on which to dream future adventures. Little is to be found on the boat – thank you again for putting this out there.